One of the scourges of collecting old computers is the cheese-yellow colouring some of them develop over time. Up until mid-2008 conventional wisdom said this couldn't be reversed and lovers of these old machines just had to put up with in. In fact, it was felt by some that yellowing added a certain "venerable" air to such units. Others though, myself included, prefer machines that look new out of the box. Fortunately, a solution to this problem has now been discovered. Through a number of discussion groups including The Vintage Computer Forum, of which I'm an active member, theories have been developed, recipes and techniques have been tried and things have been discovered. You can read a summary on this wiki. My own contribution was to develop a recipe for a paint-on paste that used inexpensive, easy-to-get, safe ingredients which could be purchased over the counter, and mixed up in a kitchen with the minimum of appliances (i.e. a spoon, a small bowl and a microwave). I take no credit for discovering this technique. Its inventor is the author of the wiki above, and many people have refined the process. My contribution is the use of Arrowroot, as one option for developing a paste when Xanthan Gum gum is hard to come by. I will not be responsible for any damage to people or vintage equipment as a result of using this recipe. I am confident of both its safety and effectiveness but it has not been tested extensively and contains chemicals you need to be careful with. You use it ENTIRELY at your own risk. That said, I'd be very surprised if any damage does occur. In the unlikely event it does, I'd like to hear the details. I'd also be interested in hearing about any successes. Wear gloves. Even a low concentration of hydrogen peroxide can burn, especially when heated. 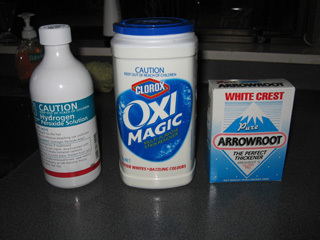 Make up a 1/2 to 2/3 cup of hydrogen peroxide solution containing two heaped tablespoons of Arrowroot by gradually adding small quantities of both ingredients alternately while stirring. Heat in a microwave until the solution becomes a thick paste (about 45 seconds for a 750 Watt microwave. Less for higher powered units). Do not overheat. If doing for the first time, check after every 15 seconds and stir between checks to ascertain progress. Add a very small amount of Oxy (1/5 of a teaspoon). Stir into mixture. If the mixture seems too thick stir it vigorously, which will thin the mixture a little. It will foam some, but it is not explosive. The mixture is now ready for use and will remain potent for at least two days. The process relies on UV light, which can be found in full sunlight, or a UV lamp. Paint onto yellowed cases (remove the computer inside first, of course), leave in bright sunlight or (preferably) under a UV light for 48 hours or until entirely de-yellowed. Re-apply the paste when necessary to prevent it drying out. When finished, simply wash the case thoroughly in warm water to remove any residue. Some things to be aware of. The paste can fade/damage labels. I would suggest avoiding painting these or covering them with something before applying the paste. Also, bleaching/damage has been found to occur on some coloured cases where paste has been allowed to dry and sit for long periods in the hot sun. Avoid this. The recipe above is not the only one. In fact, tentative results from comparative trials suggest xanthan gum/glycerine is a better thickener than arrowroot as it doesn't dry out so quickly. You can see the xanthan gum recipes at the wiki. However, it you have trouble finding those ingredients (they are less common) and/or don't mind re-appying a little more often, the above recipe will certainly do the job. You may want to treat keys as well. Do this by simply soaking them in a hydrogen peroxide solution activated with laundry booster (no Arrowroot needed) for 48 hours in the sun or under a UV light. Stuff the inside of the keys with "blue-tack" to stop them floating. There is more advice on the wiki and you can also read about my own experience with key decolourisation (along with a discussion on this in the Apple IIe blog above). Overtreatment can lead to minor fading of key characters and "streaking". Is this recipe above (and others in the wiki) the final word? No, This is a new technique and people are still experimenting with it. There is a good chance these recipes will be modified/improved in the future. The science behind it seems sound though. Amended/updated, 12th March, 2009, 24th March, 2009.